Over the past few years, the championship best-of-three series to determine college baseball’s champion has put the Mark Knopfler tune “Going Home” into my head. 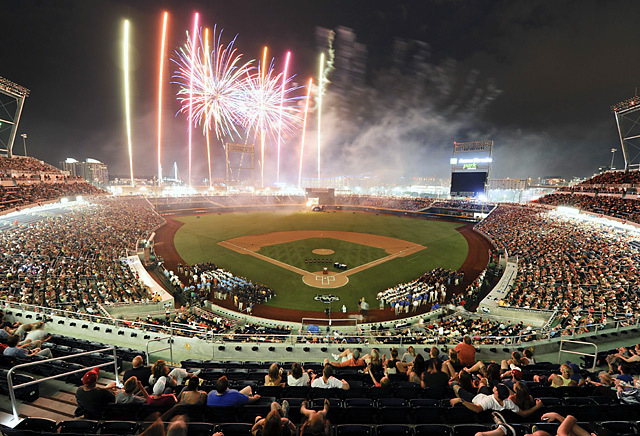 Reason being: CWS Week is where all the memories of home flood in. If you have decided to make your home away from your birthplace, there are certain things that take you home, whether you are ready or not. It could be a smell. It could be a taste. It could be a visual. *Zesto’s. Mmmmmm. Zesto’s. ‘Nuff said. *Speaking of food, there’s also Runza…Valentino’s…Big Fred’s…ummmm, Jim’s Rib Haven…Spaghetti Works. King’s. Don and Millie’s. Just to name a few. *Carting down a hibachi before 7 a.m. to commence tailgating. For a 2 p.m. first pitch. Burgers, brats, beer for me and for you. Whoever you are, wherever you are from. Sharing is part of the CWS experience. *Laughing at the people who had to park across Interstate 80 because they didn’t plan properly (i.e., get there beyond early). Until I fell into that poor planning boat. *Beach balls. Lots and lots of beach balls. And lots and lots of boos for security. They must not have had much to do, the way they attacked the beach balls that escaped the outfield seats. *Going from the CWS one night and welcoming the Omaha Royals back to town the next…with about 2,500 people in the stands at Rosenblatt. *Pictures of the Henry Doorly Zoo Desert Dome in the background. 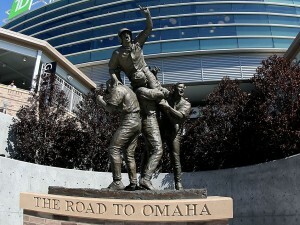 Which leads me to my favorite College World Series memory (which, in turn, has nothing to do with the two championship games I have witnessed). In 1993, a good friend of mine and I watched Wichita State and Arizona State put up a relative yawner until the later innings. The Shockers led for most of the contest. ASU’s Sean Tyler, who as I recall was barely batting .180, was up in the seventh inning with a chance to tie the game only to strike out badly (it was about as bad as you can look on a swinging strikeout). He came up in the ninth with the Sun Devils down three and almost automatically down in an 0-2 hole. I kidded my friend about what he would do if Tyler homered. Tyler worked the count to 2-2 and then lasered a pitch somewhere through the late June haze to we-still-don’t-know-where to tie the game. Tyler refused to come out towards us in the left field bleachers until his soft toss partner overshot him on purpose, giving us a chance to give him the “we’re not worthy” body gesture. I got one of the biggest bruises to my left shoulder I have ever received. And we never finalized that bet. Bleep. *Watching lightning from thunderstorms rock the TV towers near 72nd and Ames. *Video games after softball at Godfather’s Pizza. Granted, the video game of choice for us was Arch Rivals. Man. I just dated myself. *Pickup baseball games, if you can call them that, at Fontenelle Park. The one-on-one backyard battles with my brother, most of which I lost. 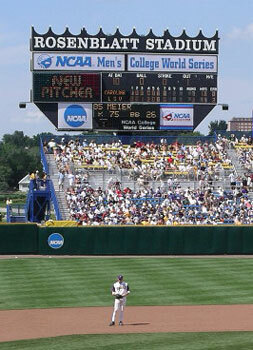 *Rosenblatt Stadium. Memories are softening, meaning the actual experience probably wasn’t as ideal as I remember, but it was a great place to watch a game. Pete and I worked in the stadium press box for most of three summers, selling tickets for the Omaha Royals’ Merchant Night production. That experience also gave me my first press box view for practicing my baseball play-by-play. It was also a pretty cool concert venue for acts like the Beach Boys and Huey Lewis to play after games were done. I knew the stadium had to go, but it still was painful to see the stadium in disarray before it was torn down. *The Old Market and the revitalized downtown area. I know the Old Market renovations were ongoing when I was a kid, but the rest of downtown…where was that when I was growing up? And along those lines, what triggered Omaha going from 350,000 people with nothing to do to…someplace pretty fricking cool? *The big slide at the Gene Leahy Mall. Take your kids there, once the renovations are all done. *Meals with my parents. And just spending Sundays at home with nothing to do but talk with my parents, watch sports or a movie, talk some more or even take a nap. As Mississippi State and UCLA begin their best-of-three set tonight, I’ll be watching for those sights of home. I’ll be “Going Home” in my mind until next year. And at some point, my daughter can experience the wonder that is the College World Series.